Nothing like a fresh coat of white paint. As I noted in my previous post, I regret not getting more done this summer around the house. What did get done focused mostly on the backyard and pool area; while my efforts to get the front lawn back in order bore some fruit, it was not until September that I was really able to get to work on the front of the house. As I noted in previous posts, I have been working to restore the fence that flanks both sides of the house. I was finally able to complete the restoration of the large post at the west side, and then continued sanding and repainting all the fence pickets in-between. As of this writing, I have completed three of the eight 8-foot sections of fencing. With the sides facing the front of the house, I applied a very high-quality latex, working it in with a brush; I may use my new paint sprayer for the rest, to save time. 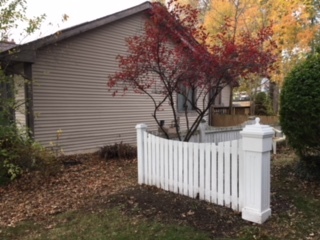 I think I have re-painted this fence maybe twice in 25 years; this was by far the most complete wire-brush-and-sanding job that I have ever done, so hopefully it will last for a while. The treated cross beams are fine; a few of the cedar pickets (especially where they have been in contact with the ground) have seen some rot. This will be hidden by a treated 1” x 4” that I am adding at the bottom, which will not only look better buy hold back some of the soil and mulch I am adding in front. 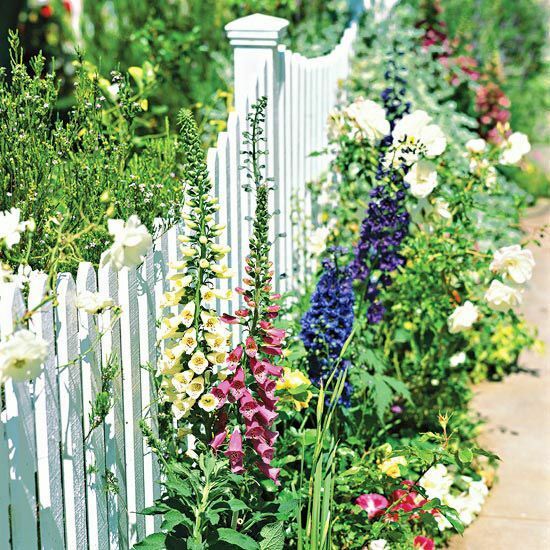 Thus, I gave the flower beds (which reside in front of these fences) a thorough weeding and tilling—since it seems grass grows better in a flower bed than it does in the yard—and they had also been invaded by assorted weeds and vinca vines that had creeped in. Yeah - that's what I'm talkin' about. This also gave me an opportunity to consider a much-needed update to my planting scheme. When we first built the house, the trees in front were not so large, and the flower beds there got a lot more sunlight throughout the day. As a result, the tall tiger-lillies we inherited form my mother-in-law’s garden did wonderfully, combined with a nice purple spiderwort and a few small daylilies. Time has taken its toll, however. Only two of the sections get sufficient sunlight these days, and the tiger lilies have more recently suffered from some kind of blight, which renders the bottom of the stalks and leaves yellow and brown. It may be a lack of oxygen or a similar issue, since they had never been divided. 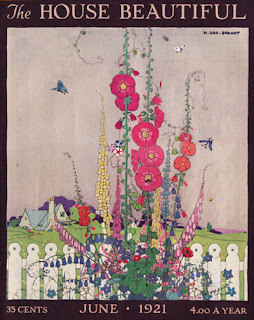 Remembering the wonderful old hollyhocks we had at the back of our old house, I am planning on replacing the tiger lilies with those—a more “English-looking” garden flower. I’ll leave the spiderwort in front of these and may also include a few four-o-clocks, which we also had at our old house. On the west side, something else will be called for, since the big oak tree out front (a beautiful specimen, with a trunk straight enough for a ship’s mast) casts that side of the yard in shade/semi-shade much of the day. I’m thinking maybe planting some foxglove on this side, and perhaps something else that can tolerate the light conditions. These three beds are each approximately 8 feet wide and 3 feet deep. 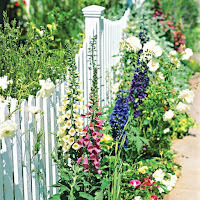 Till now, I had simply edged them with a spade, but to keep out the weeds I am considering a raised border of some sort. My first inclination is to use timber; I’m leaning toward using 2” x 8” with the bottom 2” buried. This will leave about 6” above ground, but then I am also planning to route the boards with joint grooves to give it a stone/masonry look—then staining it a beige/gray to match the house foundation color. I need to work in a couple inches of improved soil, compost and leaf mulch as well, so the raised border will help hold it in.